When the first Dynasty Warriors game came out on the PlayStation 2 it was a technical marvel. Players were greeted with hundreds of enemies on screen at a time across huge expansive battles. And the horses! Oh my the horses look so real. But it didn't take long until the game's began showing their age, and soon numerous other titles easily surpassed what we once marveled at. 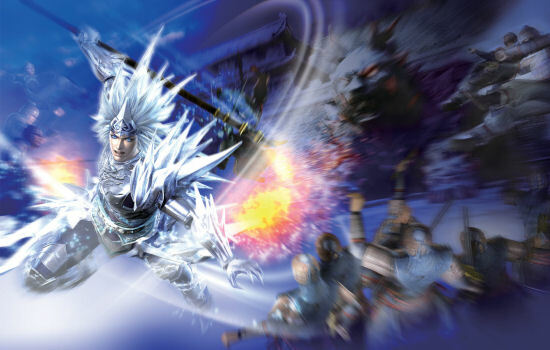 We've seen spin offs of the franchise and tweaks and turns along the way adding and removing elements, but nothing has been done quite like Dynasty Warriors Strikeforce. How is it so different while remaining true to the core of what makes Dynasty Warriors games so fun? While the changes may not be immediately noticeable, the core concept of Dynasty Warriors remains the same, it's a mindless action game. But what Koei has done is layered on different textures of gameplay to add to the depth of the game. The biggest is an almost RPG like leveling system for your officer with heavy character customization. As you complete quests and missions you'll earn experience, pick up items, and unlock officer cards for your empire. While your character levels up from earned experience, you'll power up different aspects of your character making him or her stronger, faster, and more agile. The items you acquire can be used to create new weapons, upgrade existing weapons, unlock Chi skills or build orbs. Each of these things adds another layer of depth to the game. I know where this spear is going....MEOWWWWWWWW! The Chi skills are assigned to your various appendages, with up to four being in play at a time. These can be things like faster movement, the ability to hover, stronger attacks, or passive abilities like healing your group in co-op. The orbs on the other hand get plugged into your weapons and unlock new abilities and strengths with them. While you can have as many weapons as you'd like, you can only battle with a primary and a secondary weapon from one of the games 2 dozen or so types. Another item to collect is officer cards, these cards are earned after completing missions and each officer has bonuses that are applied to your city. One officer might increase your Blacksmith's level 10 points every battle, which once unlocked, yields stronger weapons and abilities that you can work with. Your city becomes the hub world between missions, and your staging ground for everything else in the game. The cities also provide a seamless gateway into the multiplayer co-op portion of the game. You'll simply switch your city to a host city, or join another and up to four people can then quest together. Players can complete quests for any of the officers in the game and their progress is reported back to their single player game. One of the best things you'll immediately notice about the co-op is the ability to show off your customized officer and weapons to other players. With 40 different officers to choose from for your character, it's rare to see even two similar players in one game. 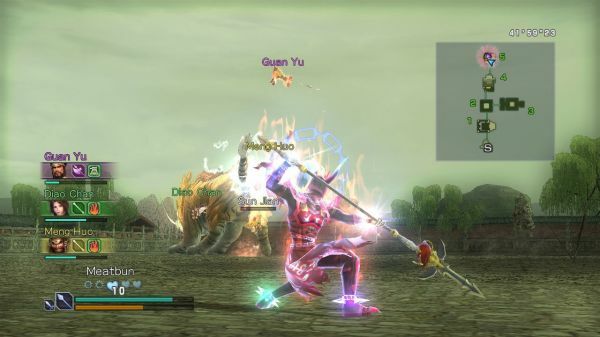 Players can customize their character's outfit, and their character reflects which Chi skills they have equipped with glowing bonuses rings surrounding their character. Your primary weapon is also on display and at anytime you can walk up to a player character and get a baseball card style state sheet on all of their attributes. In the hub world you can also trade most of the items you found, including officer cards, between players and plan for the next battle.